A Yemeni Interior Ministry document shows images of Qassim al-Raimi. (CNN) -- Air raids in northern Yemen killed six operatives with al Qaeda in the Arabian Peninsula, Yemen's Ministry of Defense said Friday. The main target was the group's military commander, Qassim al-Raimi, the Yemeni Embassy to the United States said in a written statement. The defense ministry said al-Raimi was killed. A Yemeni government official briefed in detail on the matter said the Yemeni government is "almost certain" that al-Raimi was killed. The official described al-Raimi as the third-highest-ranking figure in al Qaeda in the Arabian Peninsula in Yemen. The group has claimed responsibility for the attempted bombing of a U.S.-bound airliner on December 25. Investigators have said intelligence ties the bombing suspect, Umar Farouk AbdulMutallab, to the group. Yemeni forces carried out an air raid at 2:30 p.m. near Alajasher in the country's far north, the Yemeni Embassy to the United States said in its statement. "Security authorities suspect that three of al Qaeda's most dangerous operatives -- Ammar Ubadah al-Waeli, Ayeth Jaber al-Shebwani, Saleh al-Tayes -- may have been also eliminated," the embassy said. "Furthermore, counterterrorism units backed by helicopters continue to hunt down two al Qaeda operatives that escaped the air raid." The Yemeni government official briefed on the matter said al-Shebwani was killed. He was in charge of recruiting people into the group in the Ma'areb region and was a "very important figure, the person who provided logistical support to all foreign nationals recruited in AQAP in Yemen," the official said. A Yemeni security official with knowledge of the case said colleagues said another operative killed was Abu Ayman al-Masri. 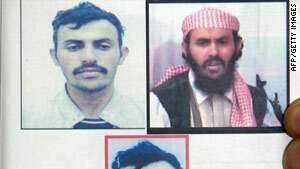 The U.S. National Counterterrorism Center's Web site says that after al Qaeda in the Arabian Peninsula emerged in January 2009, its leadership was composed of al-Raimi and the group's emir, Nasir al-Wahishi, both of them "veteran Yemeni extremist leaders," as well as two Saudis, one of whom surrendered to Saudi authorities last year. Friday's air raid "marks the fifth major strike on al Qaeda positions in less than a month," the embassy said.